Supreme Scream is a Turbo Drop amusement ride located at Knott's Berry Farm in Buena Park, CA. It opened to the general public on July 3, 1998 as the tallest turbo drop–type amusement ride in the world. 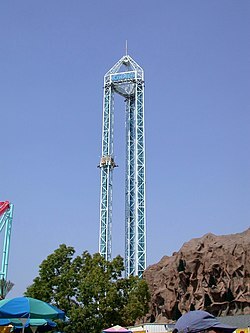 The ride consists of three individual Turbo Drop model towers arranged in a triangular footprint; the three towers joined at their peaks by a 60-foot-tall (18 m) pyramidal crown and marquee. The entire structure is 312 feet (95 m) tall from the base to the top of the structure (325 feet (99 m), including topping flagpole) and is the tallest free-standing structure in Orange County. Supreme Scream carries 12 riders per tower in octagonal carriages upward at a speed of 8 miles per hour (13 km/h) before pausing for a brief moment at a height of 252 feet (77 m). Utilizing pneumatics paired with a pulley system, the ride carriages are then accelerated downward faster than a true free-fall to attain a top speed of 45 miles per hour (72 km/h)—exposing riders to a maximum G-force of 4 and negative G-force of -1a. Tagline: "30 Stories Up. 3 Seconds Down."